This article is about the canton. For the village, see Appenzell (town). For the historical canton, see canton of Appenzell. For other uses, see Appenzell (disambiguation). The canton of Appenzell Innerrhoden (German: [ˈapənˌtsɛl ˈɪnərˌroːdən] ( listen); in English sometimes Appenzell Inner-Rhodes) is the smallest canton of Switzerland by population and the second smallest by area, with canton of Basel-City being the smallest. It was the last Swiss canton to grant women the right to vote on local issues, in 1991. The name Appenzell (Latin: abbatis cella) means "cell (i.e. estate) of the abbot". This refers to the Abbey of St. Gall, which exerted a great influence on the area. By the middle of the 11th century the abbots of St. Gall had established their power in the land later called Appenzell, which, too, became thoroughly Teutonized, its early inhabitants having probably been Romanized Raetians. By about 1360, conflicts over grazing rights, taxes, and tithes were causing concern for both the abbot and the farmers of Appenzell. Both parties wanted to protect their rights and interests by joining the new Swabian League. In 1377 Appenzell was allowed to join the League with the support of the cities of Konstanz and St. Gallen (the city of St. Gallen was often at odds with the neighboring Abbey of St. Gall). With the support of the League, Appenzell refused to pay many of the gifts and tithes that the Abbot Kuno von Stoffeln demanded. In response to the loss of revenue from his estates, Kuno approached the Austrian House of Habsburg for help. In 1392 he made an agreement with the Habsburgs, which was renewed in 1402. In response, in 1401 Appenzell entered into an alliance with the city of St. Gallen to protect their rights and freedom. Following increasing conflicts between the Appenzellers and the abbot's agents, including the bailiff of Appenzell demanding that a dead body be dug up because he wanted the man's clothes, the Appenzellers planned an uprising. On a pre-arranged day, throughout the abbot's lands, they attacked the bailiffs and drove them out of the land. Following unsuccessful negotiations Appenzell and St. Gallen entered into a treaty, which marked a break between the abbot and his estates. Perhaps fearing the Habsburgs, in 1402 the League expelled Appenzell. During the same year, St. Gallen reached an agreement with the abbot, and Appenzell could no longer count on St. Gallen's support. Appenzell declared itself ready to stand against the abbot, and in 1403 formed an alliance with the Canton of Schwyz, a member of the Old Swiss Confederation that had defeated the Austrians in the previous century. Glarus provided less support, but authorized any citizen who wished to support Appenzell to do so. In response, the League raised an army and marched to St. Gallen before heading toward Appenzell. On 15 May 1403, they entered the pass leading to Speicher and outside the village of Vögelinsegg met the Appenzell army. A small force of Appenzell and Confederation troops defeated the League army and the two sides signed a short-lived peace treaty. Following another Appenzell victory on 17 June 1405, at Stoss Pass on the border of Appenzell town, the new canton continued to expand. During the expansion, Appenzell even captured the abbot of St. Gall and in response they were excommunicated by the Bishop of Constance. However, while the Bund expanded, the Austrians used the peace to regain their strength. On 11 September 1406 an association of nobles formed a knightly order known as the Sankt Jörgenschild (Order of St. George's Shield) to oppose the rebellious commoners of the Bund. Following a defeat at Bregenz, Appenzell was unable to hold the Bund together. The city of St. Gallen and the Canton of Schwyz each paid off the Austrians to avoid an attack, and the Bund was dissolved by King Rupert of Germany on 4 April 1408. As part of the peace treaty, the abbot gave up his ownership of Appenzell, but was still owed certain taxes. However, it was not until 1410 that the area was at peace. In 1411 Appenzell signed a defensive treaty with the entire Swiss Confederation (except Bern), which strengthened their position against the abbot. Appenzell joined the Confederation as an "Associate Member", and did not become a full member until 1513. Following another battle, in 1429, Appenzell was granted freedom from the obligations in the future. This treaty represented the end of Appenzell's last financial tie to the Abbey of St. Gall, and a movement towards closer relationships with the Confederation. Starting in 1522, followers of Martin Luther and Huldrych Zwingli began to preach the Protestant Reformation in Appenzell. The early reformers had the most success in the outer Rhoden, a term that in the singular is said to mean a "clearing", and occurs in 1070, long before the final separation. Following the initial small success, in 1523 Joachim von Watt (also known as Joachim Vadian) began to preach the reformed version of the Acts of the Apostles to friends and fellow clergy. His preaching brought the Reformation into the forefront of public debate. In October 1523, the Council supported the Protestant principle of scriptural sermons, and on 24 April 1524 the Landsgemeinde confirmed the Cantonal Council's decision. However, the work of the Anabaptists in the Appenzell region (as well as in Zurich and St. Gallen) in 1525 led to government crackdowns. The first police action against the Anabaptists took place in June 1525, followed by the Anabaptist Disputation in Teufen in October 1529. To end the confrontation between the old and new faiths, the Landesgemeinde decided in April 1525 that each parish should choose a faith, but that the principle of free movement would be supported, so that the religious minority could attend the church of their choice regardless of where they lived. The entire Appenzell Ausserrhoden converted to the Reformation in 1529. The Innerrhoden remained with the old faith. While the majority of the residents of Appenzell town remained Catholic under Pastor Diepolt Huter, there was a strong Reformed minority. In 1531, the minority were nearly successful in getting the town to ally with the Protestant Ausserrhoden. But an armed mob of angry residents from the neighboring village of Gonten prevented the abolition of the Mass in Appenzell. The Catholic victory in the Second War of Kappel in 1531 ended plans for a reformation of the entire Canton of Appenzell. After the Second War of Kappel, the two religions reached a generally peaceful parity. They remained united by common business interests, the same political and legal understanding, a shared desire to form an alliance with France and a shared opposition to the city of St. Gallen. This shared opposition to St. Gallen was demonstrated in the so-called linen affairs (1535–42, 1579), in which the weavers throughout Appenzell supported each other when they felt that they were unfairly treated by the linen industry of St. Gallen. 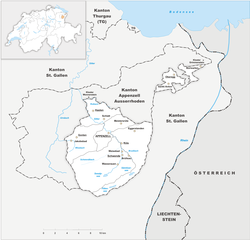 From 1798 to 1803 Appenzell, with the other domains of the abbot of St Gall, was formed into the canton of Säntis of the Helvetic Republic, but in 1803, on the creation of the new canton of St. Gall, shrank back within its former boundaries. Appenzell Innerrhoden was the last canton in Switzerland to grant women the right to vote on local issues, being forced to do so only in 1990 when two women from Appenzell filed a lawsuit in the Swiss Federal Court and won. A centuries-old law forbidding women from voting was changed in 1991, when Switzerland's federal court ordered the canton to grant women the right to vote. Most of the canton is pastoral, this despite being mountainous. The Säntis peak in the Appenzell Alps is one of the main attractions of the canton. There are three small mountain lakes in the canton: Seealpsee, Sämtisersee and Fälensee. Appenzell is the capital of this canton. The constitution was established in 1872. 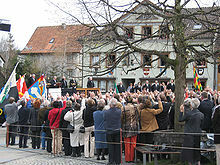 Citizens from the canton assemble each year on the last Sunday of April for the Landsgemeinde (general assembly) in a square in Appenzell; they elect the cantonal government and judiciary, accept the oath of the elected members, and vote on several issues on the agenda; about 4000 citizens usually participate. In 1991, following a decision by the Federal Supreme Court of Switzerland, Appenzell Innerrhoden became the last Swiss canton to grant women the vote on local issues. It also was the canton with the strongest support for the minaret ban in the Swiss minaret referendum, 2009, at 71%. In Appenzell Innerrhoden, districts are the lowest administrative division, as the canton has no municipalities (except for the Feuerschaugemeinde, a special-purpose municipality for firefighting, energy and water for the town of Appenzell). The districts are functionally equivalent to municipalities elsewhere in Switzerland, and are generally shown as municipalities on maps etc. The State Commission (Standeskommission) constitutes the executive government of the canton of Appenzell Inner-Rhodes and operates as a collegiate authority. It is composed of seven councillors (German: Regierungsrat/-rätin), each presiding over a department (Departement) comprising several offices and bureaus. The president of the executive department acts as an executive president (regierender Landammann). In the mandate period (Legislatur) 2015 – 2017 the State Commission is presided by regierender Landammann Roland Innauen. The regierende Landammann and the stillstehender Landammann (stationary president) are switched every two years. Departmental tasks, coordination measures and implementation of laws decreed by the canton's parliament, the Grosse Rat, and the Landsgemeinde, as well as legal judgments are carried by the State Commission. The regular (re-)election of the State Commission by the Landsgemeinde is held every year. Any resident of Appenzell Inner-Rhodes allowed to vote can be elected as a member of the State Commission. The assignment of the departments for the Säckelmeister (minister of finance), Landeshauptmann (country's captain), Bauherr (minister of building and civil engineering), and Landesfähnrich (country's ensign) are given by their roles. The departments of education, economics, and health and social services are assigned by the collegiate to the two Landammänner and the Statthalter. As of September 2016[update], Appenzell Inner-Rhodes' State Commission is made up of five members of the CVP (Christian Democratic People's Party), and two independents of whom one is currently also the president. The last regular election (Landsgemeinde) was held on 24 April 2016. Citizens from the canton assemble on the last Sunday of April each year for the Landsgemeinde (literally: country's assembly) in the central square in Appenzell, elect the cantonal government and judiciary, accept the oath of the elected members, and vote on several issues put forward by the government and/or the parliament. It is presided over by the regierende Landammann. Every Swiss citizen of Appenzell Inner-Rhodes older than 18 has the right to vote and to step onto the Stuhl (literally the chair, but in fact the podium) and to debate the election of the proposed members of government and judiciary, or any of the issues to be voted on. After the State Commission have taken their seats on the Stuhl and the regierende Landammann opens and welcomes the assembly,(s)he then presents the state bill[clarification needed]. Then the discussions are opened. Then the elections and the subsequent oaths take place. Finally the votes on the programmed issues are taken. The Grosser Rat or Grand Council is composed of 50 members, elected in the six districts of the canton. In five of the six districts, the election takes place once a year in the annual session of the district equivalent of the Landsgemeinde and therefore takes place in the open. In the other district, Oberegg District, which forms two small exclaves of the canton a few miles northeast of the rest, a separate ballot is held in May. The most important tasks of the Council are providing preliminary advice on the constitutional and legislative proposals to be placed before the Landsgemeinde. Also, the issuing of regulations to enforce the canton's legislation and supervision of all the cantonal authorities. The Council reviews and approves the annual financial statements, and sets the budget and the tax rates. On 18 October 2015, in the federal election for the Swiss National Council the most popular party was the Christian Democratic People's Party (CVP) which won the only seat for the canton with 76.3% of the vote. With this result the previous National Councillor Daniel Fässler, who also holds the position of the stillhaltender Landammann of Appenzell Inner-Rhodes, was re-elected. The opponent of the SP received 18.1% of the vote. In the federal election, a total of 4,090 votes were cast, and the voter turnout was 36.7%. On 18 October 2015, in the federal election State Councillor (German: Ständerat) Ivo Bischofberger, member of the Christian Democratic People's Party (CVP), was re-elected in the first round as single representative of the canton of Appenzell Inner-Rhodes in the national Council of States (German: Ständerat). He has been a member of it since 2007. The population of the canton (as of 31 December 2017) is 16,105. As of 2007[update], the population included 1,510 foreigners, or about 9.76% of the total population. Owing to the split of Appenzell along religious lines, the population (as of 2000[update]) is nearly all Roman Catholic (81%), with a small Protestant minority (10%). Cattle breeding and dairy farming are the main agricultural activities: Appenzeller cheese is widely available throughout Switzerland. Somewhat before the early 2000s, the idyllic countryside of Appenzell Innerrhoden apparently became popular with nudists, and at the 2009 Landsgemeinde the canton's residents voted to prohibit naked hiking. Violators would be fined. However nudists who appealed against their fines to the federal court have been reimbursed by the local authorities, as nudism is not a crime under Swiss federal law which takes precedence. It is common for cars rented in Switzerland to be registered in Appenzell Innerrhoden, and thus having license plates starting with "AI", because of the reduced tax on cars in this canton. ^ a b c d e Karl Heinz Burmeister: Appenzeller Kriege in German, French and Italian in the online Historical Dictionary of Switzerland, 2001-08-14. ^ a b c d Williams, Henry Smith (1908). The Historians' History of the World. 16. Hooper & Jackson. pp. 581–583. ^ Karl Heinz Burmeister: Sankt Jörgenschild in German, French and Italian in the online Historical Dictionary of Switzerland, 2001-01-21. ^ a b c Achilles Weishaupt: Appenzell (Kanton) - 4 - Von der Reformation zur Landteilung (1597) in German, French and Italian in the online Historical Dictionary of Switzerland, 2011-10-06. ^ "1990 - Einführung des Frauenstimmrechtes" (in German). Appenzell, Switzerland: Kanton Appenzell Innerrhoden. Archived from the original on 22 August 2016. Retrieved 7 August 2016. ^ "Appenzell Innerhoden [sic] enjoys 'pure democracy'". theLocal.ch. 24 May 2013. Retrieved 3 June 2013. Voting in Appenzell requires a large dose of patience. The more than 3,900 people crowded into the ring remain standing — only the elderly and handicapped are provided with seats — for more than three hours... "This is a very special occasion," whispers a woman standing outside the circle: "They will count the votes!" — something that hasn't happened for the past decade. For the count to happen, the crowd slowly splits into two currents and trickles out of the ring through two separate exits, each representing a candidate. Four counters at each exit click their buttons for each person who walks by. ^ a b c "Standeskommission (Regierung)" (official site) (in German). Appenzell, Switzerland: Kanton Appenzell Innerrhoden. 30 June 2016. Archived from the original on 20 November 2008. Retrieved 5 August 2016. ^ "Landsgemeinde" (official site) (in German). Appenzell, Switzerland: Kanton Appenzell Innerrhoden. Archived from the original on 8 August 2016. Retrieved 5 August 2016. ^ "Kanton Appenzell Innerrhoden, Nationalrat, 1 Sitz" (in German, French, and Italian). Neuchâtel, Switzerland: Swiss Federal Statistical Office. 18 October 2015. Retrieved 5 August 2016. ^ "National Council - Results: Basle-Town". Berne, Switzerland: Swiss Federal Confederation. 18 October 2015. Retrieved 5 August 2016. ^ Nationalratswahlen: Stärke der Parteien nach Kantonen (Report) (in German and French). Neuchâtel, Switzerland: Swiss Federal Statistical Office. 17 November 2015. Archived from the original (XSL) on 2 August 2016. Retrieved 5 August 2016. ^ "Council of States - Results: Appenzell Inner-Rhodes". Berne, Switzerland: Swiss Federal Confederation. 18 October 2015. Retrieved 7 August 2016. ^ Federal Department of Statistics (2004). "Wohnbevölkerung nach Religion". Archived from the original (Interactive Map) on 29 December 2008. Retrieved 15 January 2009. Wikimedia Commons has media related to Canton of Appenzell Innerrhoden. This page was last edited on 16 February 2019, at 18:57 (UTC).